When one thinks of hot sauce, Sriracha, Tapatío, or *gasp* sauces from Del Taco or Taco Bell would come to mind. There are restaurants like Buffalo Wild Wings and Howlin’ Ray’s in Los Angeles that cater to fans of spicy food. (You can check out our Howlin’ Ray’s spicy challenge video here.) With that said, there are plenty of hot sauces out there in the world. 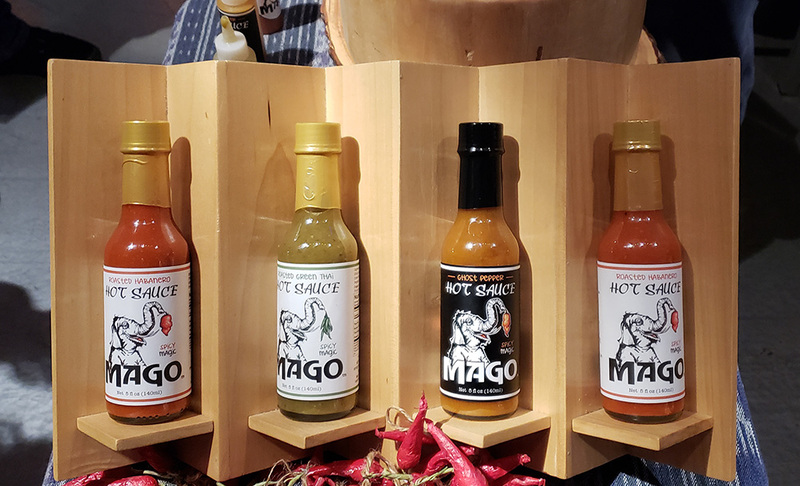 Nerd Reactor recently checked out The Hot Sauce & Beer Crawl featuring Heatseeker, Ghost Scream and Mago hot sauces in Orange County, CA, and it has opened our eyes and taste buds to the local hot sauce scene. The Hot Sauce & Beer Crawl is a partnership with three breweries (Bottle Logic, Asylum Brewing, Hoparazzi) and hot sauce makers Heat Seeker, Ghost Scream and Mago. 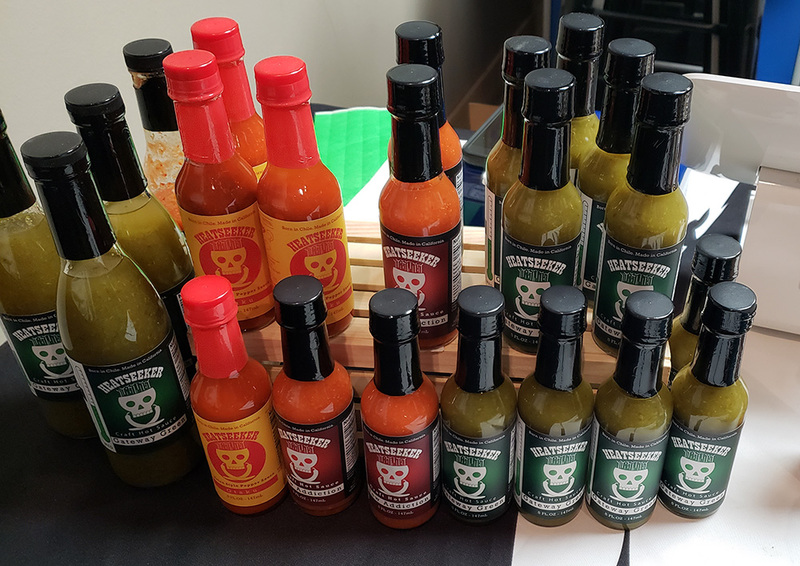 The event allowed guests to try out different hot sauces, and if they liked it, they can purchase them at the booth. 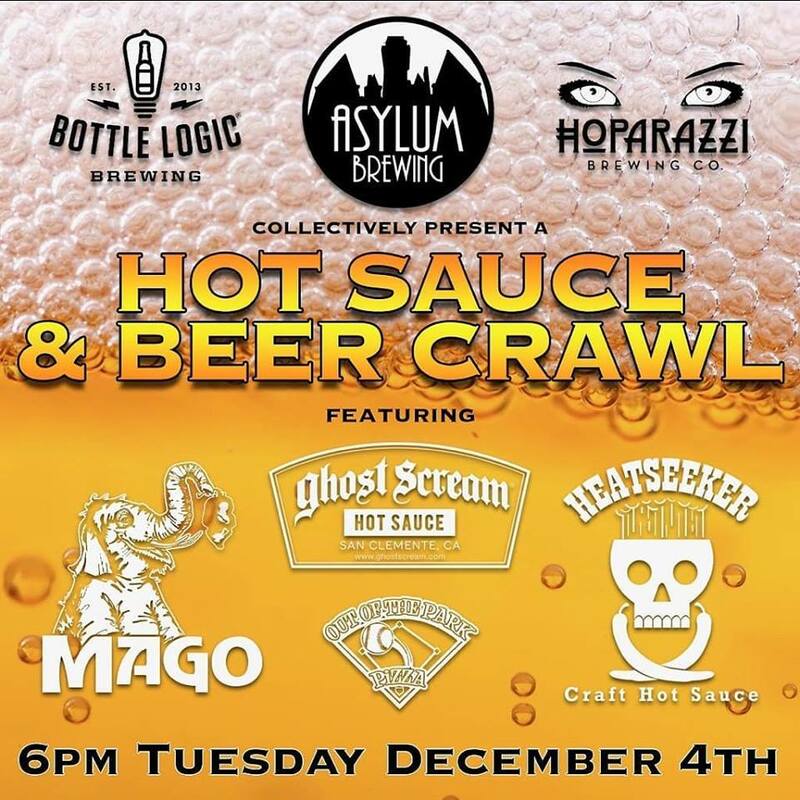 The Ghost Scream booth was located at Bottle Logic, Heatseeker at Asylum Brewing and Mago at Hoparazzi. Heatseeker was the first hot sauce booth we checked out with owner Daryl Vaughn. His table featured his private collection of hot sauces along with hot sauces he’s created like Gateway Green, New Addiction, and Otaku. Otaku is the limited one of the bunch and is inspired by Sriracha. The entry-level hot sauce is Gateway Green that contains lime juice, cilantro, and jalapeño peppers and is perfect for Mexican street tacos. We actually tried it before at a local Mexican taco restaurant and enjoyed it so much that the bottle was almost empty. New Addiction is a classic red sauce that contains garlic, onion, and dried red peppers. It’s a fusion of Mexican and Louisiana-style hot sauces and is our favorite of the bunch, which we tried it out with cheese pizza. You can visit heatseekersauce.com for more info. Next up is Mago, which was showcasing Ghost Pepper, Roasted Habanero, and Roasted Green Thai. The least spicy of the bunch is the Roasted Habanero. Our second favorite is Roasted Green Thai, which has a nice kick while still being flavorful. People bought this one when we were there at the booth. Our absolute favorite is the Ghost Pepper Hot Sauce. Owner Clark Olson has rated the spicy level a four out of five, and we’ll have to agree. I was sweating all over my neck, but the sauce was too tasty to stop. You can check out MagoHotSauce.com to purchase the bottles and look up recipes like Ginger Dressing, Jerk Sauce and Peanut Sauce. 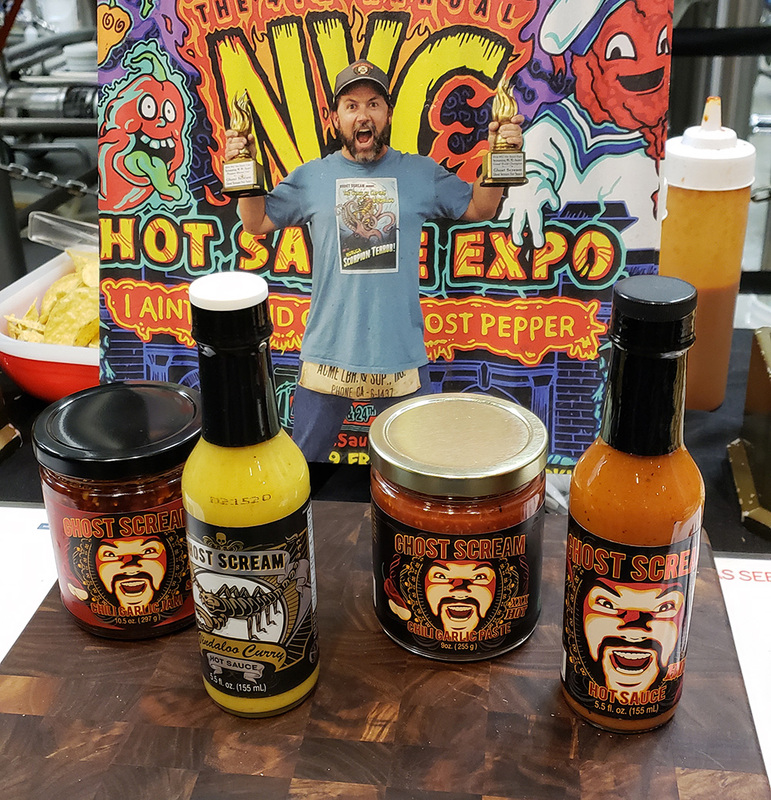 Last but definitely not least is Ghost Scream, an award-winning sauce that was recently featured on Live with Kelly and Ryan. Matt Sisson is the co-owner and is quite a character. Just look at the label and see the craziness of his face, which gives you an idea of what you’re getting into. The Original hot sauce, Curry hot sauce and Chili Garlic Paste were all yummy. We’re fans of all the sauces, but Ghost Scream Chili Garlic Jam really comes out on top due to its unique taste. It has a nice and sweet taste at first, and after that, it will give you a good kick. We did a taste test with cracker and cream cheese and were instantly blown away. Who knew a spicy jam would complement cheese and crackers? I also used this with McDonald’s chicken nuggets instead of the usual sweet and sour sauce, and now I can’t go back. I definitely want to try this with egg rolls next time. For more info, visit ghostscream.com. The post Local hot sauces have opened our eyes… and taste buds appeared first on Nerd Reactor.